ISOS is a software product that objectively and automatically quantifies conjunctival hyperemia in ocular surface images. Conjunctival hyperemia is an important indicator of several ocular conditions including ocular surface inflammation, ocular irritation, and systemic disease. It is associated with increased blood volume in the anterior scleral, bulbar conjunctival and limbal vessels. Since conjunctival hyperemia is a consistent clinical sign of the ocular response to physiological and pathological stimuli, it has been considered an important endpoint in efficacy and safety trials for contact lenses, medications, as well as for evaluation of ocular toxicity of drugs, chemicals and pollutants. Thus, assessing the progression of conjunctival hyperemia is critically important for the treatment of patients with ocular disease. The imaging system of the ocular surface (ISOS) developed by ADCIS, in partnership with Alcon Laboratories, Fort Worth, TX, USA, is compatible with a slit lamp-based imaging system which generates high-resolution color images of the ocular surface. ISOS consisting of hardware and software components was developed to capture images and perform automated image analysis of conjunctival blood vessel morphology, as a first pilot study run by Alcon Laboratories, Inc to assess the inconvenience caused by wearing contact lenses, and was tested on a large scale by Novartis, Inc. to obtain and analyze conjunctival images from patients with allergic conjunctivitis following allergen challenge. Patients were placed in an Environment Exposure Chamber, and successive images were captured at different time lapses. Manual image grading was performed by experts that indicate redness value between 0 (no redness) and 4 (extreme redness). The images were then stored in a specific database. This database is called the learning base, and for the various projects, was made up of 230 to 5000 images. Thereafter all acquired images were placed in an evaluation database for automatic classification and determination of the fully automatically redness. Drawing on the expertise of CBIO laboratory of Mines ParisTech, ADCIS has developed a classification based on random forests to determine the redness without manual operator intervention. More than 35 parameters computed on the set images collected during the two studies were used to develop a classifier for the automatic assessment. The classifier generated is integrated into ISOS software. These measurements included vessel density, number of branching points, tortuosity, branch length between two vessel intersections, and a set of densitometry parameters. 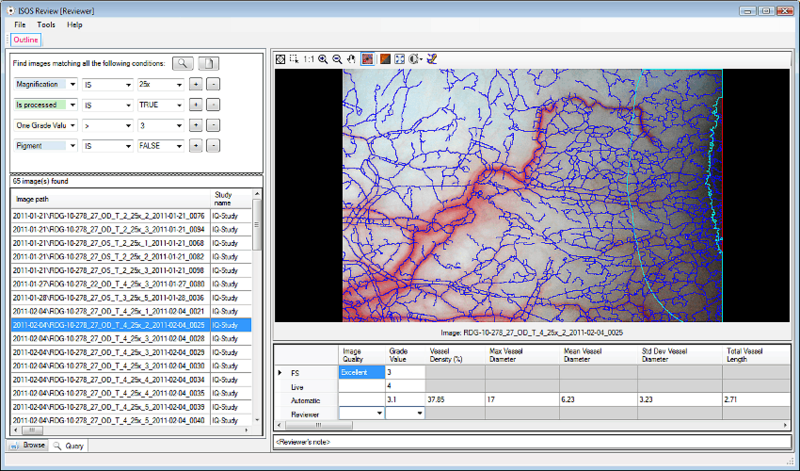 The automatic image analysis software in the ISOS evaluates changes in the morphology of the vessels that were not quantifiable to clinical observers (e.g. vessel dimensions such as diameter, total length, density), and correlate them with human grading. An experienced human operator can classify redness on a scale of 0 to 4. The ISOS software thus uses 35 parameters automatically calculated to replicate the manual classification and this more quickly, more reproducible and more accurate since the redness is determined in floating point number It turned out that the automatic classification provided by the ISOS software was more robust, highly correlated to the manual classification of the image, and was able to provide an objective score of hyperemia in a few seconds. Two pilot studies have shown that ISOS software suite is a valuable tool for objective assessment of conjunctival hyperemia. The software has minimized the changes in classification between images and provided clinically relevant measures of conjunctival hyperemia and a good estimate of the progression of ocular hyperemia. The ISOS software is faster, more reliable, more accurate, and eliminates the bias in the determination of conjunctival hyperemia. Three types of users can interact with ISOS: Graders, Viewers and Reviewers. A Grader is an expert in a field relevant to the project who annotates each image to identify and comment about the objects that are significant to the Viewers. A grade is given to each image, ranging on a scale between 0 and 4. Typically, there will be multiple graders annotating the same image set. To avoid bias, ISOS only allows a Grader to see her/his own annotations. A Viewer is someone who has a need for the information contained in the Graders’ annotations, but is not provided with any capability to change the Graders’ results. Viewers include computer programmers developing algorithms to automatically detect the graded objects, statisticians analyzing the results to better understand the causes and progressions of disease, and those monitoring the grading process. A Reviewer is someone who can see all the information (Grader’s annotations, automatic measurements), export grades and measurements, perform queries on the image database and register images. ISOS has been successfully used in two pilot studies carried out by large pharmaceutical companies. It provides an accurate assessment of eye redness in a timely manner. In conjunction with the use of an Environment Exposure Chamber, it allows to quickly analyze images of patient eyes, and save all data in a database that can be later used in the clinical study. Llámenos para saber más sobre ISOS.